It was February 2004. 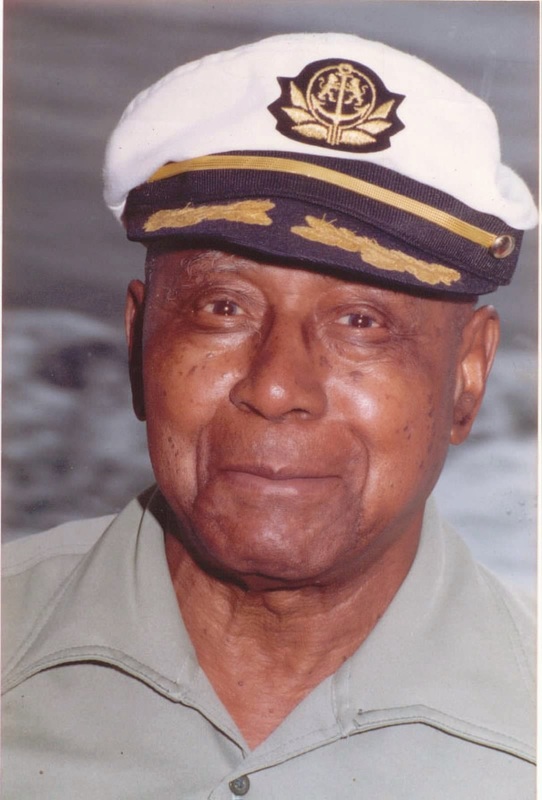 Lawrence Atlas, the oldest living descendant of King Atlas, Sr. (b. Bet 1809-1810, d. Bet 1891-1892) and the oldest living alumnus of Tuskegee (Institute) University, had died at the age of 97. Family, friends, and colleagues had gathered to say goodbye to this gentle and kind man. I thought I too had gathered to say goodbye to my grand uncle, but I later learned it was the beginning of a interesting genealogical journey. 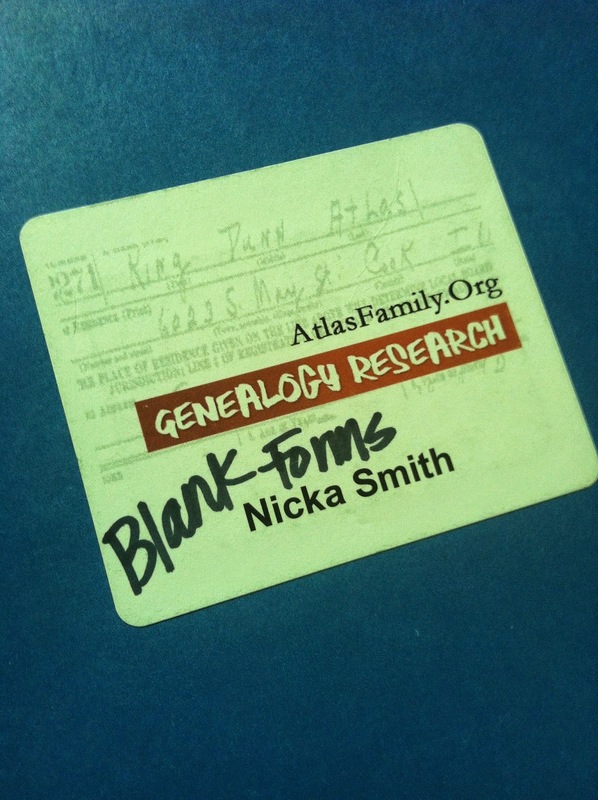 In 1999, I had started AtlasFamily.Org and until 2004 or so, I had never really peered deeply into genealogy research. Soon, I was bit by the bug and trying to find out as much as I could about any and everyone who was related to the Atlas family. 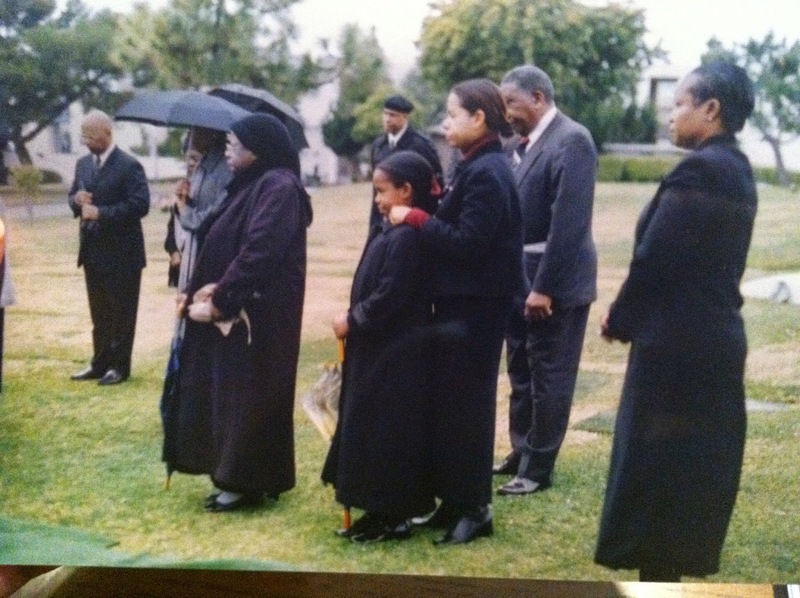 I was lucky to have a cousin and genealogist in the family, Marilyn E.P. White, who mentors me. In the words of my grandmother, she "had the good sense" to have a photographer and videographer at Uncle Lawrence's funeral services. At the time, it seemed odd, but being a decently seasoned researcher now, I am SO GLAD she did that. More on that later. Marilyn unearthed a treat for me, my mother, and grandmother before we left for the services. In her possession was an old scrapbook that included photos of Uncle Lawrence and his siblings, including my grandmother. These are, to date, the youngest photos I have ever seen of my grandmother, her siblings, and their nieces and nephews. Their childhood home burned in the 1950s and everything was lost, including the family bible. 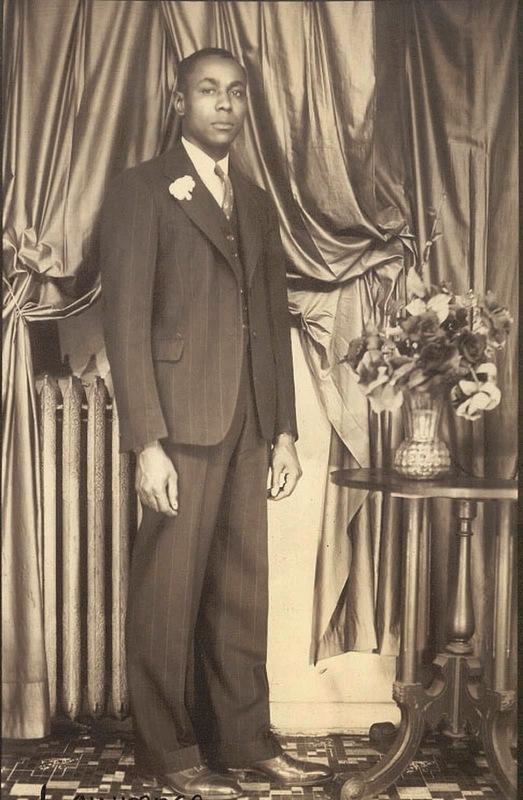 I was able to see Uncle Lawrence as a young man (the picture at left was one of the photos in that album). The photographer cousin Marilyn hired took this three generation photo of my grandmother, mother, and me going through the scrapbook. 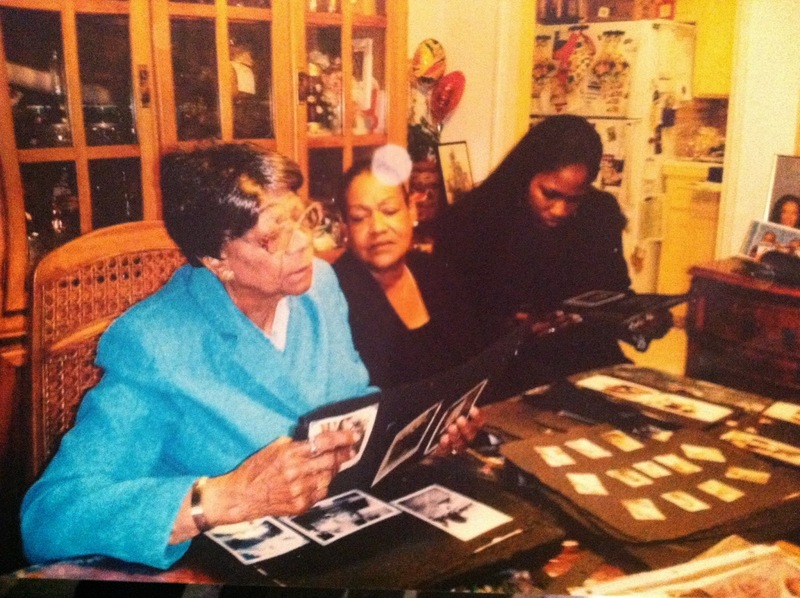 Left to right: Grannie, Mom, and Me going through Uncle Lawrence's scrapbook. February 2004. The services went on without a hitch. Presentations by CA legislators, resolutions, words from attendees. Then, we made our way to Holy Cross Cemetery. While there, a cousin, E.R.Z., took the time to introduce us to another person she believed to be a family member we had never met before. in February 2004. Leonard is standing off center, second from the right. resemblance he bared to his second cousin Lawrence. Through nothing short of genealogical serendipity, cousin E.R.Z. had encountered Leonard Atlas while she was at work based solely on his surname. Let's be honest, how many people do you know with the last name Atlas?!? As they talked, they discovered that they had a grandfather with the exact same name, William Atlas, and that their families were from the same town, Lake Providence, East Carroll, LA. E.R.Z. and Leonard kept in contact and later, she invited him to attend Uncle Lawrence's funeral. Cousin E.R.Z. introduced us to Leonard while we were at the cemetery. At first, everyone was puzzled by the connection and at the time, no one could make heads or tails of it. Years later, I would discover that Leonard was also direct male descendant of King Atlas, Sr.. Leonard descended from King Sr.'s son William Steven Atlas, Sr. and Uncle Lawrence from King Sr.'s son, King Atlas, Jr. Leonard and Uncle Lawrence were SECOND COUSINS! Defining a History for William Steven Atlas, Jr.
William Steven Atlas, Jr. was born between 1866-1875 in Carroll/East Carroll Parish, LA to Sarah Hewlett and William Steven Atlas, Sr.
Last, William Jr. married Indice Rudolph on March 3, 1937 in Phillips, AR. (2) There were no known children born to this union. Between 1919 and 1922, William Jr. left the northeast Louisiana area and migrated to Hornor or what is now West Helena, Phillips, Arkansas. He later died there on February 3, 1938 (2). Due to this migration, family members lost contact and thus had to be reunited nearly 1,800 miles away in California. "Help me find my brother." Following the funeral, I was able to have several conversations with cousin Leonard about what he knew about our family history. One of the things he always told me was that he wanted me to help him find his brother Jesse. At first, I told Leonard that he had died in Chicago in 1927. He was adamant that I was wrong and that he didn't die at just two years of age. He then relayed to me that he had a brother named Jesse who was younger than him, but was adopted by another family following the death of their mother during Jesse's childbirth. He knew his exact birth date. Aha, this would definitely be the reason why Jesse is not enumerated on the 1930 US Census (3, left) with Leonard and the rest of the family. Leonard went on to say that Jesse had been adopted by Morris Sisson, the woman who had delivered him, and that he believed he may have taken her surname instead of the Atlas surname. From there, I searched the 1930 US Census for Jesse and found him listed as the adopted son of Morris and her husband, T.L. (4) I searched the SSDI over and over and had no viable leads. 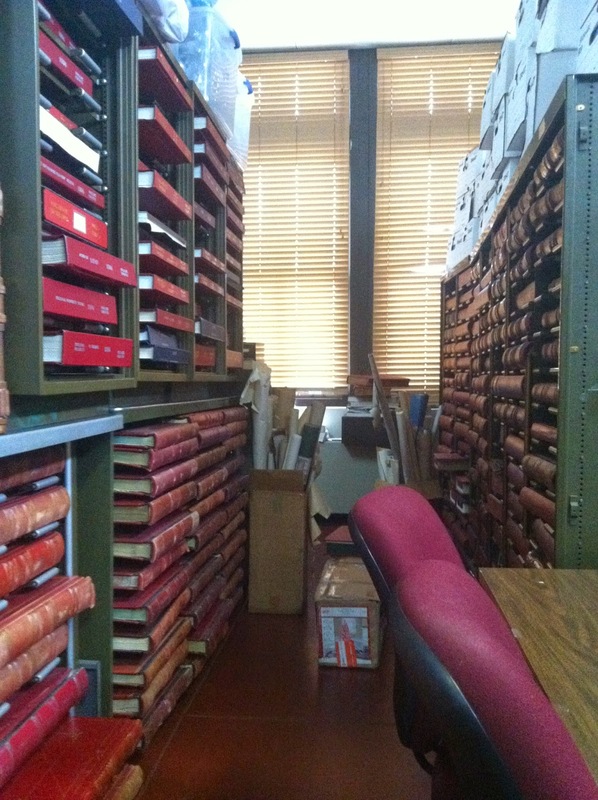 US Public Records, nada. Unfortunately, by the time the 1940 US Census was released, Leonard had passed away. I didn't forget my promise to him though. I found Jesse still living in Phillips County, AR, only this time, he was going by the surname Atlas and not Sisson. (5) He was 14 years old. This was the last record I found for Jessie. Let's Take a Trip to Helena! 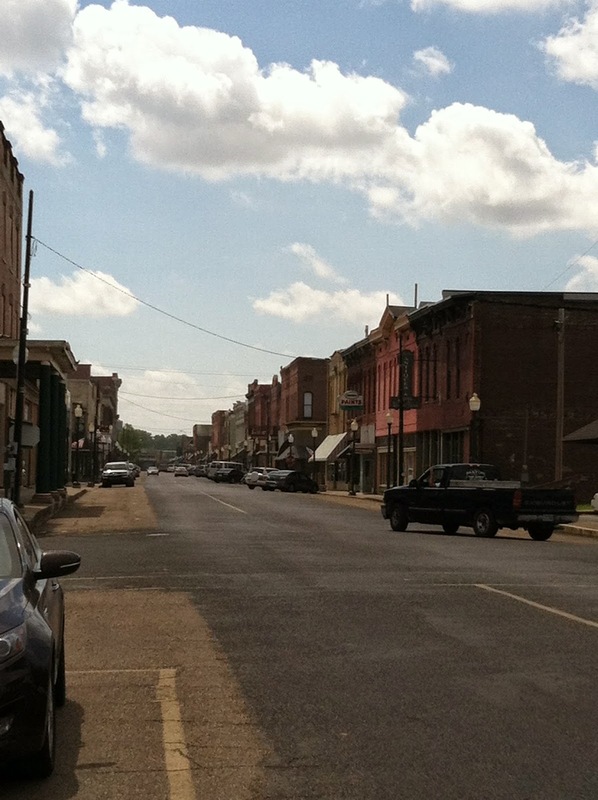 With no other leads online, the next logical step was to take a gander at microfilm or take a trip to Phillips County, AR to see if I could find anything on Jesse. Luckily, I now lived only two hours drive from there. So, in September 2014, I took a trip to see if I could successfully locate Jesse. marriage of William Jr. to Indice Rudolph. info on Jesse and his whereabouts. on the cost of copies in the long run. I started my search at the Phillips County courthouse and came up empty handed when it came to new information. There was nothing on Jesse at all when it came to marriages, deeds/conveyances, court cases...you name it, I asked about it and searched it with both clerks. I imagine that this is an issue with anyone who has family who were not land owners or firmly established in a community. On a positive note, I did see the actual marriage license instead of just an index record for William Jr.'s marriage to his last wife and was able to add that as a source to our database. As with all other research trips, the next logical step is to head to the county library or a local genealogical or historical society to see if they have any information. The county clerk notified me of a local society and told me that they had done a fair amount of work on African American genealogy in the area. 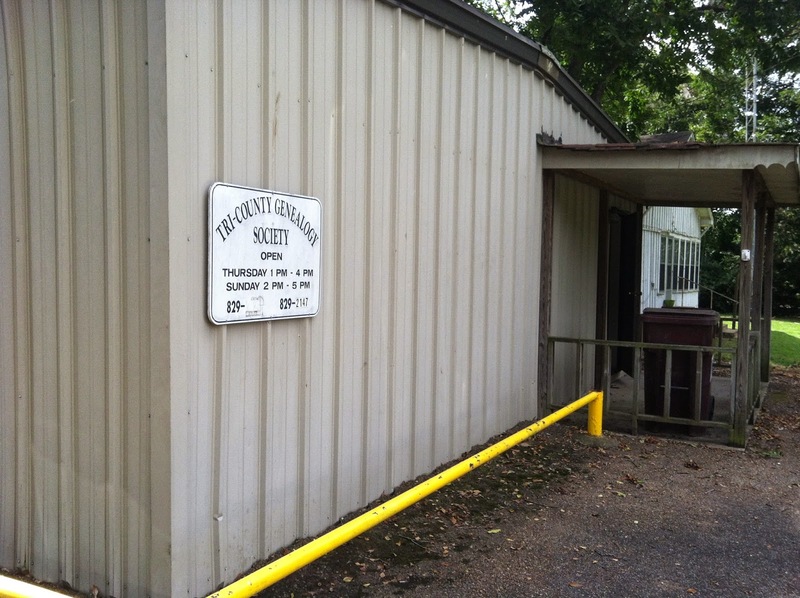 Next, I drove to Marvell, AR to visit the Tri-County Genealogical Society. Tri-County Genealogical Society Building, Marvell, AR. 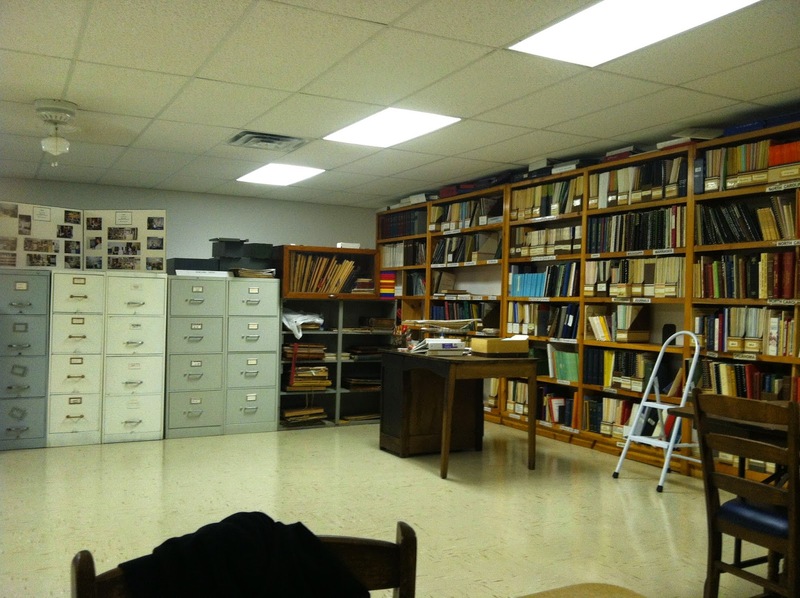 Inside the Tri-County Genealogical Society in Marvell, AR. 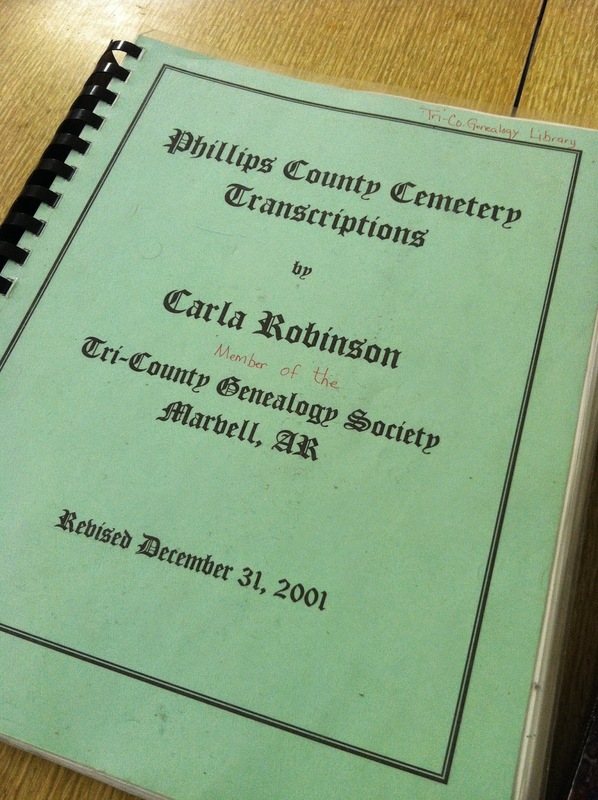 With the help of one of the members/volunteers named Ms. Carrie, I was able to locate a book of burials in the county entitled Phillips County Cemetery Transcriptions by Carla Robinson. 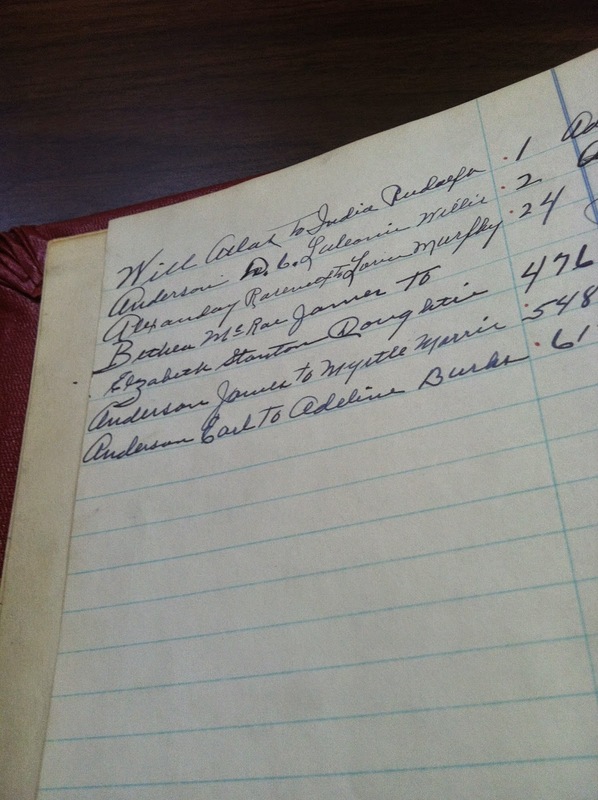 This book held transcriptions of African American burials in the area from various sources but mostly African American funeral home records in the area and canvassing of African American cemeteries. While it contained a notation for William Jr., there was nothing for Jesse. Rats! Regardless, the book is an excellent resource for those researching African American genealogy in Phillips County. Next, I headed to the county library to see if there was a glimmer of hope there. Again, absolutely nothing. While I have to admit it was disappointing not to find anything on Jesse, the trip and my efforts weren't a lost cause. In this world we live in, we often want things to happen quickly or without delay. I've learned in my years of genealogy that most of the time this doesn't happen. It can take years to get just a single fact or add a single name to a branch of a family tree. The negative part is not in all the time it took, but it's in the very act of NOT making the effort to find the information that lead to discovering that single name. Our team can now stand on the fact that we did make an effort to find Jesse, and while we didn't find him now, eventually we will. Hopefully this post will aid in our efforts. 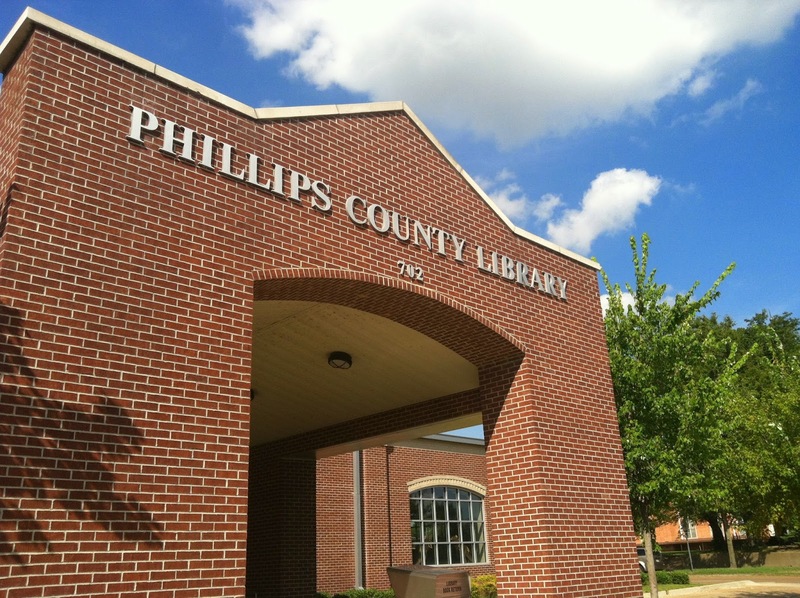 Phillips County, AR public library. Madison Parish, LA Marriage Books, 1898-1900, Atlas, William to Elnora Doan, February 14, 1900. FHL Film # 311941. "Arkansas, County Marriages, 1837-1957," index and images, FamilySearch (https://familysearch.org/pal:/MM9.1.1/N9M3-1MH : accessed 09 Sep 2014), Will Atlas and India Rudolph, 03 Mar 1937; citing , Phillips, Arkansas, United States; FHL microfilm 1002891. "Arkansas Death Index, 1914-1950," index, FamilySearch (https://familysearch.org/pal:/MM9.1.1/VJRK-CFX : accessed 16 Sep 2014), William Atlas, 03 Feb 1938; derived from "Arkansas, Death Index, 1914-1950," index and images, Ancestry.com (http://www.ancestry.com : 2005); a multigenerational derivative citing Division of Vital Records, Arkansas Department of Health, Arkansas Death Index, 1914-1950 (Arkansas: Arkansas Genealogical Society). 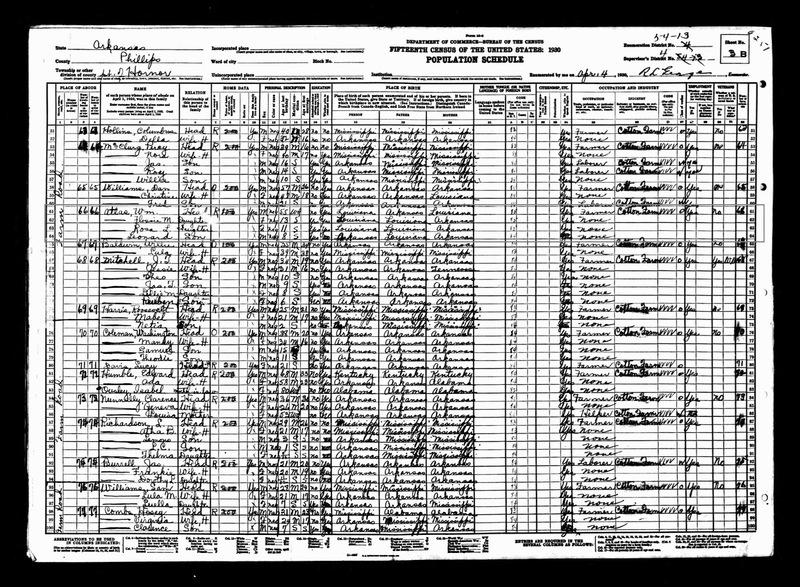 "United States Census, 1930," index and images, FamilySearch (https://familysearch.org/pal:/MM9.1.1/XMGM-FM4 : accessed 01 Oct 2014), Leonard Atlas in household of Wm Atlas, Hornor, Phillips, Arkansas, United States; citing enumeration district (ED) 0013, sheet 3B, family 66, NARA microfilm publication T626, roll 87. "United States Census, 1930," index and images, FamilySearch (https://familysearch.org/pal:/MM9.1.1/XMGM-SWQ : accessed 01 Oct 2014), Jesse Sisson in household of T L Sisson, Hornor, Phillips, Arkansas, United States; citing enumeration district (ED) 0013, sheet 2A, family 35, NARA microfilm publication T626, roll 87. 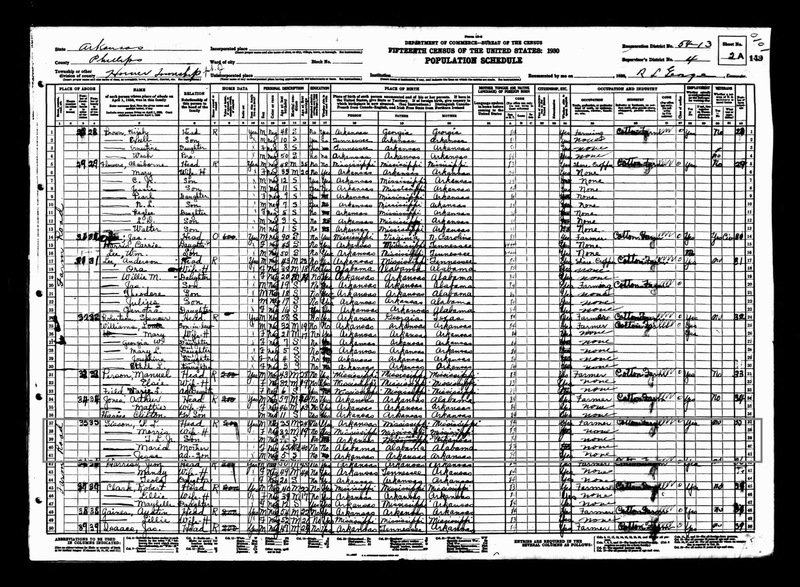 "United States Census, 1940," index and images, FamilySearch (https://familysearch.org/pal:/MM9.1.1/KQKG-FQZ : accessed 21 Jul 2014), Jessie Atlas in household of Liddel Cottrel, Hornor Township, Phillips, Arkansas, United States; citing enumeration district (ED) 54-13, sheet 4A, family 2, NARA digital publication of T627, roll 160.